This article is about the honorific title. For the nawab butterfly, see Polyura. "Naib" redirects here. For other uses, see Naib (disambiguation). Nawab (Bengali: নবাব/নওয়াব, Sylheti Nagari: ꠘꠀꠣꠛ, ꠘꠛꠣꠛ, Devanagari: नवाब/नबाब, Perso-Arab: نواب) also spelt Nawaab, Navaab, Navab, Nowab, Nabob or Nobab, was an honorific title ratified and bestowed by the reigning Mughal emperor to semi-autonomous Muslim rulers of princely states in the Indian subcontinent. "Nawab" usually refers to males and literally means Viceroy; the female equivalent is "Begum" or "Nawab Begum". The primary duty of a Nawab was to uphold the sovereignty of the Mughal emperor along with the administration of a certain province. The title of "nawabi" was also awarded as a personal distinction by the paramount power, similar to a British peerage, to persons and families who ruled a princely state for various services to the government of British India. In some cases, the titles were also accompanied by jagir grants, either in cash revenues and allowances or land-holdings. During the British Raj, some of the chiefs, or sardars, of large or important tribes were also given the title, in addition to traditional titles already held by virtue of chieftainship. The term "zamindari " was originally used for the subahdar (provincial governor) or viceroy of a subah (province) or region of the Mughal empire. Nawab is a Hindustani term, used in Urdu, Hindi, Bengali and many other North-Indian languages, borrowed via Persian from the Arabic honorific plural of naib, or "deputy." In some areas, especially Bengal, the term is pronounced nobab. This later variation has also entered English and other foreign languages as nabob. The term "Nawaab" is often used to refer to any Muslim ruler in north or south India while the term "nizam" is preferred for a senior official—it literally means "governor of region". The Nizam of Hyderabad had several nawabs under him: Nawabs of Cuddapah, Sira, Rajahmundry, Kurnool, Chicacole, et al. "Nizam" was his personal title, awarded by the Mughal Government and based on the term "Nazim" as meaning "senior officer". "Nazim" is still used for a district collector in many parts of India. The term "nawab" is still technically imprecise, as the title was also awarded to Hindus and Sikhs, as well, and large zamindars and not necessarily to all Muslim rulers. With the decline of that empire, the title, and the powers that went with it, became hereditary in the ruling families in the various provinces. Under later British rule, nawabs continued to rule various princely states of Awadh, Amb, Bahawalpur, Balasinor, Baoni, Banganapalle, Bhopal, Cambay, Jaora, Junagadh, Kurnool (the main city of Deccan), Kurwai, Mamdot, Multan, Palanpur, Pataudi, Radhanpur, Rampur, Malerkotla, Sachin, Rajoli and Tonk. Other former rulers bearing the title, such as the nawabs of Bengal and Oudh, had been dispossessed by the British or others by the time the Mughal dynasty finally ended in 1857. Some princes became Nawab by promotion, e.g. the ruler of Palanpur was "diwan" until 1910, then "nawab sahib". Other nawabs were promoted are restyled to another princely style, or to and back, e.g. in Rajgarh a single rawat (rajah) went by nawab. The style for a nawab's queen is begum. Most of the nawab dynasties were male primogenitures, although several ruling Begums of Bhopal were a notable exception. Before the incorporation of the Subcontinent into the British Empire, nawabs ruled the kingdoms of Awadh (or Oudh, encouraged by the British to shed the Mughal suzerainty and assume the imperial style of Badshah), Bengal, Arcot and Bhopal. The title nawab was also awarded as a personal distinction by the paramount power, similarly to a British peerage, to persons and families who never ruled a princely state. For the Muslim elite various Mughal-type titles were introduced, including nawab. Among the noted British creations of this type were Nawab Hashim Ali Khan (1858–1940), Nawab Khwaja Abdul Ghani (1813–1896), Nawab Abdul Latif (1828–1893), Nawab Faizunnesa Choudhurani (1834–1904), Nawab Ali Chowdhury (1863–1929), Nawaab Syed Shamsul Huda (1862–1922), Nawab Sirajul Islam (1848–1923), Nawab Alam yar jung Bahadur, M.A, Madras, B.A., B.C.L., Barr-At-Law (1890–1974). There also were the Nawabs of Dhanbari, Nawabs of Ratanpur, Nawabs of Baroda and such others. Nawaab was also the rank title—again not an office—of a much lower class of Muslim nobles—in fact retainers—at the court of the Nizam of Hyderabad and Berar State, ranking only above Khan Bahadur and Khan, but under (in ascending order) Jang, Daula, Mulk, Umara and Jah; the equivalent for Hindu courtiers was Raja Bahadur. This style, adding the Persian suffix -zada which means son (or other male descendants; see other cases in prince), etymologically fits a nawbab's sons, but in actual practice various dynasties established other customs. 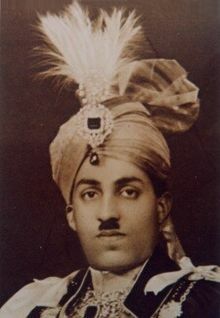 For example, in Bahawalpur only the nawbab's heir apparent used nawabzada before his personal name, then Khan Abassi, finally Wali Ahad Bahadur (an enhancement of Wali Ehed), while the other sons of the ruling nawab used the style sahibzada before the personal name and only Khan Abassi behind. "Nawabzadi" implies daughters of the reigning nawbab. Elsewhere, rulers who were not styled nawbab yet awarded a title nawabzada. The word naib (Arabic: نائب‎) has been historically used to refer to any local leader in some parts of the Ottoman Empire, successive early modern Iranian kingdoms (Safavids, etc. ), and in the eastern Caucasus (e.g. during Caucasian Imamate). Today, the word is used to refer to directly elected legislators in lower houses of parliament in many Arabic-speaking areas to contrast them against officers of upper houses (or Shura). The term Majlis al-Nuwwab (Arabic: مجلس النواب‎, literally council of deputies) has been adopted as the name of several legislative lower houses and unicameral legislatures. For other uses, see Nabob (disambiguation). In colloquial usage in English (since 1612), adopted in other Western languages, the transliteration "nabob" refers to commoners: a merchant-leader of high social status and wealth. "Nabob" derives from the Bengali pronunciation of "nawab": Bengali: নবাব nôbab. 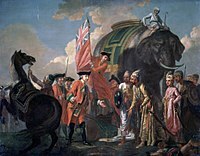 During the 18th century in particular, it was widely used as a disparaging term for British merchants or administrators who, having made a fortune in India, returned to Britain and aspired to be recognised as having the higher social status that their new wealth would enable them to maintain. Jos Sedley in Thackeray's Vanity Fair is probably the best known example in fiction. From this specific usage it came to be sometimes used for ostentatiously rich businesspeople in general. 'Nabob' can also be used metaphorically for people who have a grandiose sense of their own importance, as in the famous alliterative dismissal of the news media as "nattering nabobs of negativism" in a speech that was delivered by Nixon's vice-president Spiro Agnew and written by William Safire. ^ Origin of NABOB, Merriam-Webster.com. Retrieved 16 September 2010. ^ nattering nabobs of negativism, PoliticalDictionary.com. Retrieved 7 April 2015. Akbar, M Ali (2012). "Dhaka Nawab Estate". In Islam, Sirajul; Jamal, Ahmed A. (eds.). Banglapedia: National Encyclopedia of Bangladesh (Second ed.). Asiatic Society of Bangladesh. Islam, Sirajul (2012). "Nawab". In Islam, Sirajul; Jamal, Ahmed A. (eds.). Banglapedia: National Encyclopedia of Bangladesh (Second ed.). Asiatic Society of Bangladesh. This article incorporates text from a publication now in the public domain: Chisholm, Hugh, ed. (1911). "Nawab" . Encyclopædia Britannica. 19 (11th ed.). Cambridge University Press. p. 317.